“Interruption” thus functions as an alternative to both continuity and discontinuity. On the one hand, interruption is opposed to correlationist understandings of continuity, since faith is a radical new intrusion into the existing context. And on the other hand, interruption is opposed to conceptions of sheer discontinuity, since the context which is interrupted is altered but does not cease to exist. Interruption is the event in which an existing narrative is sharply halted and problematised, in order then to be opened up and propelled in a new direction. There is thus both continuity (since the same narrative is reconfigured and redirected) and discontinuity (since the narrative is forever changed by this new incursion). Indeed, interruption occurs precisely “where discontinuity and continuity encounter one another” (p. 103). So in contrast to any mere “correlation” between faith and its context, Boeve calls for a radical “recontextualisation” of faith’s context. This means that, although dialogue with the context can never be suspended, we must resist the correlationist longing “for harmony and synthesis between tradition and context,” and instead foreground the Christian faith’s own “particularity, contextuality, narrativity, historicity, contingency, and otherness” (p. 40). For Boeve, therefore, the fundamental datum for theological method is the fact that Christian faith is always one contingent possibility amidst a plurality of others. This confrontation of faith with plurality and otherness sets in motion the process of recontextualisation. Faith is neither a (discontinuous) “counter-culture” nor a (continuous) “partner” of secularised culture – instead, it is the irreducibly singular interruption which takes the cultural context and opens it anew towards the reality of God. Boeve takes this model of “interruption” and uses it to rethink diverse themes such as religious experience, sacramental rites, the relation between faith and science, the apophaticism of contemporary spirituality (which he nicely describes as “something-ism”), and the place of christology in interfaith dialogue. But the richest and most valuable part of the book is his analysis of time and apocalyptic in the final chapter. Here, he rightly notes that the demythologising tendency to purge the Christian message of its apocalyptic dimension “introduce[s] a perception of time that makes it impossible in principle to authentically conceptualise the radicality of the Christian faith” (p. 188). 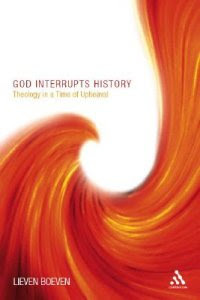 Following Johann-Baptist Metz, Boeve observes that the relation between God and time is structured apocalyptically: “God interrupts time” (p. 195). God is not part of the process of history, nor does God stand outside history. Rather, God is the boundary and crisis of history. Such a conception of time, Boeve argues, produces a “radical temporalisation” of the world, with “a radical awareness of the irreducible seriousness of what occurs in the here and now.” History thus becomes real history, and the future becomes a real future which cannot be reduced to a mere “seamless continuation” of progress, development or evolution (p. 197). The task of Christian theology is thus to submit to the interruptive judgment of God over history – and this is always a fundamentally political task, since the church must remind its cultural context that human history is also “a history of anxiety and the cry for justice.” In this way, Christian faith “disrupts the histories of conqueror and vanquished, interrupting the ideologies of the powerful” (pp. 201-4). Since one of my own interests is in developing an apocalyptic/interruptive model of divine agency from a Barthian direction, I often found myself wishing that Boeve would lean further in the direction of discontinuity, instead of returning rather hastily to a revised model of contextual correlation. But in spite of that, I’m very glad to have discovered this book. It presents a vigorous argument and provides valuable stimulus for contemporary work in theological method. In the end, I suppose my only complaint is that I would have liked to have seen even more interruption!